Wash the clothes, sweep the floor, change the bedding, do the dishes, and on and on. Moms are probably the busiest people in the world, and the most under appreciated. Unless you’re a mom, you have no clue. Seriously. Even after all the kids leave the nest, Momhood doesn’t end. Though our nest is empty, I still interact with my kids. Being a mom cannot be described as a full-time job. It doesn’t end at 5:00pm nor does it end when they turn 18 when the world says our job is officially done. 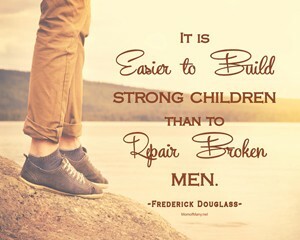 Basically, by having kids, whether by birth or adoption, we are lifers. Add to that church stuff, work stuff, home stuff…the list goes on – our TO DO LIST grows exponentially as we meet the needs of our family and interact with the world. For January, I put together MOMentum Calendar to encourage our M.O.M.s group. Each day there is something to do that we often put off because we are so busy. A surprising thing has happened for me as I have accomplished each daily challenge. Halfway in I stopped stressing about my lengthy TO DO LIST. For about 2 years I’ve stressed every day because my list has gotten so long and my available time to squeeze in extra stuff has all but vanished. I have no margin and it has caught up with me. Nearly everyone in our M.O.M. group felt the same way. 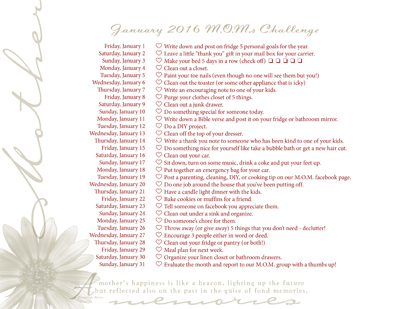 I created a January challenge to encourage my M.O.M.s and it ended up encouraging me. Because I accomplish something extra every day that isn’t on my list (like cleaning out a junk drawer), I feel accomplished, have stopped stressing about my TO DO LIST and have finally accepted that I can only do what I can do. Have you ever set big goals and then not meet them? How often have you thought: “I JUST NEED TO GET THROUGH THIS DAY”? We assume the goals have to be big and life changing to really matter. But the big life changing goals often get set aside because life happens. Instead of only setting huge goals, we need to set little daily goals too. As the month progresses, the feeling of accomplishment replaces defeat and we become hopeful and less stressed. By setting little daily goals, we work toward meeting our big goals. This is where our TO DO LIST and our goal setting meet. our TO DO LIST basically is really a daily goal planner. I know. Weirdly simple, right? So now, realizing that little written down goals are foundational to the larger, I’m designing a multi page M.O.M. planner. I am offering it free to our M.O.M.s FB group. I’m giving you a one page weekly planner sheet today to show you what I’m working on. Just click on it and I will send it to you via email. If you want to receive more pages as they are designed, join our M.O.M. Facebook group. We need to realize that our TO DO LIST is a tool, not a prison of our own making. We manage IT – IT doesn’t manage us. We are faithful. We do our best. We just need to see it – every single day. So we start now. Step by step we move forward – not by beating ourselves up over what we didn’t get accomplished but to celebrate each small success. We are not defined by how or if we complete our lists; we are defined by who we are and our part in bringing light to the world. <<< Just “click the pic” if you want to do some mini personal goal setting and commit to de-stressing your TO DO LIST by looking at it in a new light. You can fill it out to set your own goals for the week. If you are interested in taking a look at our other M.O.M. planner sheets like a password log, weekly cleaning check list, etc., join our M.O.M. Facebook group. You will have access to all of my planner sheets as I make them – FREE because you are a part of our M.O.M. group. If you would like to join us in using the monthly MOMentum calendars, click the one above and then watch for the February MOMentum calendar. If you’d like to suggest daily goals for our calendars, email me from the contact page above or join our M.O.M. group and post your ideas. I looked for years for support and didn’t find it. Join us and find other moms just like you.